LOL! Looks like I grabbed some heavy duty string to do some of the quilting! Despite that, I like the design. Nice. 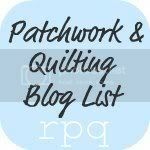 This afternoon I will be joining some friends at for a weekend of quilting … I might get a few stitches done, along with checking out what everyone else is doing, chatting a little … or maybe a lot! All that is missing is the quilting! I liked this one, but thought I could make it better. What a difference a few block changes,and a twist, make! I love Electric Quilt. I like it … but I would like it more if it had some quilting added.